Phillies Original Filtered Cigars 10/20's - 200 Little Filtered Cigars are dependable little cigarette-sized smokes that are smooth, rich, and flavorful with classic tobacco tastes and a great burn and draw. Phillies Original Filtered Cigars 10/20's - 200 Little Filtered Cigars are a top-selling machine made brand in the world, these are perfect when you are short on time. They are packed in cartons that contain 10 individual packs of 20. 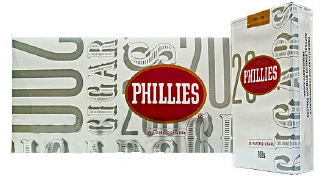 Phillies Original Filtered Cigars 10/20's - 200 Little Filtered Cigars are a higher quality product which are blended for an enjoyable smoke, these little cigars were crafted with you in mind. Experience Phillies Original Filtered Cigars 10/20's - 200 Little Filtered Cigars the leader in little cigars !